Lookout Mountain rises above Chattanooga like a sleeping giant. Two rock outcroppings, Point Park and Sunset Rock serve as perfect destinations for viewing the local landscape. A climb to these destinations rewards you with views of Georgia and North Carolina mountains, Watts Bar’s cooling towers, Chickamauga Dam, the city of Chattanooga and the Tennessee River; not to mention Signal, Elder, and Raccoon Mountains, the towns of Tiftonia and Lookout Valley and Reflection Riding Arboretum & Nature Center. Check out these six ways to get to the top. Start at the upper or lower parking lot of historic Cravens House. This is the only remaining Civil War era structure on the mountain, and it was used as a headquarters by both the Union and Confederate armies. Although it was nearly leveled during the Battle of Lookout Mountain, Cravens rebuilt it in its original form in 1866. The 3 easy trails from here are only slightly technical and all involve stairs. #1: Take the trail to the right out of the back of the upper parking lot and take the left option to Point Park when the trail splits. This trail heads gradually up, passing under a huge survivor tree branch before meeting another trail. If you turn left, you will head around to the front of the bluff and reach metal stairs that will take you to Point Park. You can’t enter the park without paying a fee, but you can enjoy the views from the museum and overlook (approx. 2.2 miles round trip). 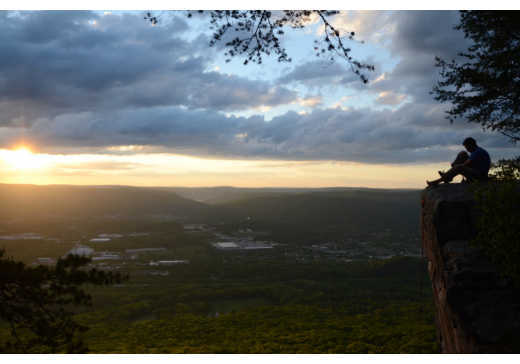 #2: If you go right toward Sunset Rock when the trail splits, you will continue around the base of the bluff of Lookout Mountain under some climbing routes and past some sweeping views of the valley to a split in the trail with rock stones that veers to the left. Follow this option and you will come out on top of Sunset Rock. You can return to Cravens House by backtracking the way you came (approx. 2.5 miles round trip). #3: For a slightly harder and longer option, hike down from Sunset Rock, turn left at the trail and take the next right turn down from the bluff. This is the Gum Springs trail and it is a fairly steep descent, but it is only about 1/2 mile long. When the Gum Springs trail ends, turn right on the Truck Trail and stay on it for less than .2 miles until it splits. Take the right and travel through rocks cut for an old railroad. Watch for the Rifle Pits Trail, a singletrack, somewhat technical but not terribly steep option, which branches off to the right. Continue on when the trail branches again and you will end up in the upper parking lot of Cravens House (approx. 3 miles). These options are each over 10 miles and combine challenging climbs and descents, technical terrain, as well as runnable and extremely scenic sections. #1: Park outside the entrance to Reflection Riding Arboretum & Nature Center, and make a short but steep climb via the Kiddie Trail, follow the Skyuka Trail south along the forested slopes to Skyuka Springs, one of the most beautiful places on the mountain. When you reach the overlook to the spring, continue on the John Smartt Trail as it ascends 2 miles to the Bluff Trail. Stay on the main trail as it rolls along the base of the bluff for 2 1/2 miles offering beautiful views of the valley below. 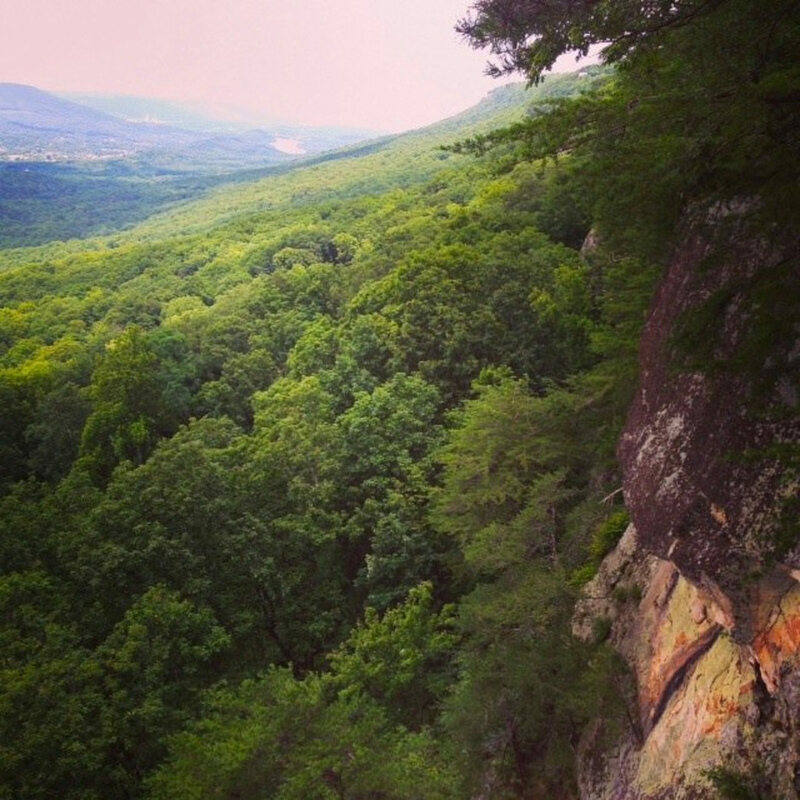 Pass the left Gum Springs Trailhead and take the next right trail and climb up to Sunset Rock to take in the views. For a quick descent, come down from Sunset Rock, turn left and then take the next right on Gum Springs Trail. When the trail T&apos;s into a wider “road”, turn right and take the next left to Lower Gum Springs Trail. Descend until the trail T&apos;s and turn right. Continue right past two left turn options and a small trail to the right with a No Horses sign. When you reach the sign that directs you to the Nature Center, turn left and descend the steep trail you hiked earlier (approx. 11 miles). #2: When you come off of Sunset Rock, you can make the route longer by turning right and following the Bluff Trail around to either climb up to Point Park, per the signs, or you can descend to Cravens House. If you descend, take the trail until there is an option to turn left onto Rifle Pits Trail. 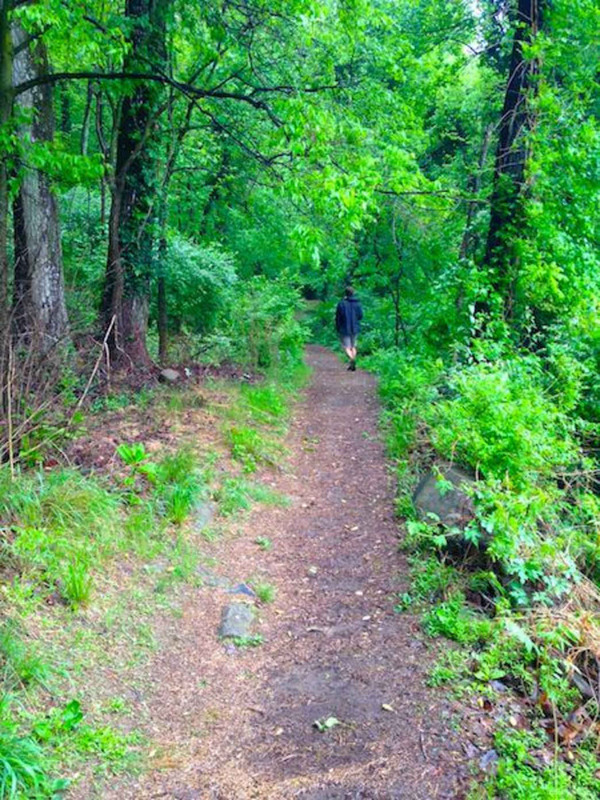 Follow this technical trail to the old railroad bed (the Guild Trail) and continue left when the trail branches. After less than .2 miles, turn right onto the single track trail (Lower Gum Springs). Descend until the trail T&apos;s and turn right. Continue right past two left turn options and a small trail to the right with a No Horses sign. When you reach the sign that directs you to the Nature Center, turn left and descend the steep trail you hiked earlier (approx. 12.5 miles). #3: You can also come off of the steps to Point Park and turn right instead of returning to the branch in the trail just over half a mile away. A longer route will take you around the front of Lookout Mountain’s brow. Look for the option to turn left and begin a descent. When the trail branches again, take the left option. You’ll end up at the back of the Cravens House parking lot. Continue on this trail along the back of the parking lot. When the trail branches to the left, stay on the main trail. This is Rifle Pits Trail. Follow this technical trail to the old railroad bed (the Guild Trail) and continue left when the trail branches. After less than .2 miles, turn right onto the single track trail (Lower Gum Springs). Descend until the trail T&apos;s and turn right. Continue right past two left turn options and a small trail to the right with a No Horses sign. When you reach the sign that directs you to the Nature Center, turn left and descend the steep trail you hiked earlier. You’ll return to the parking lot at the Kiddie Trailhead (approx. 13.5 miles). 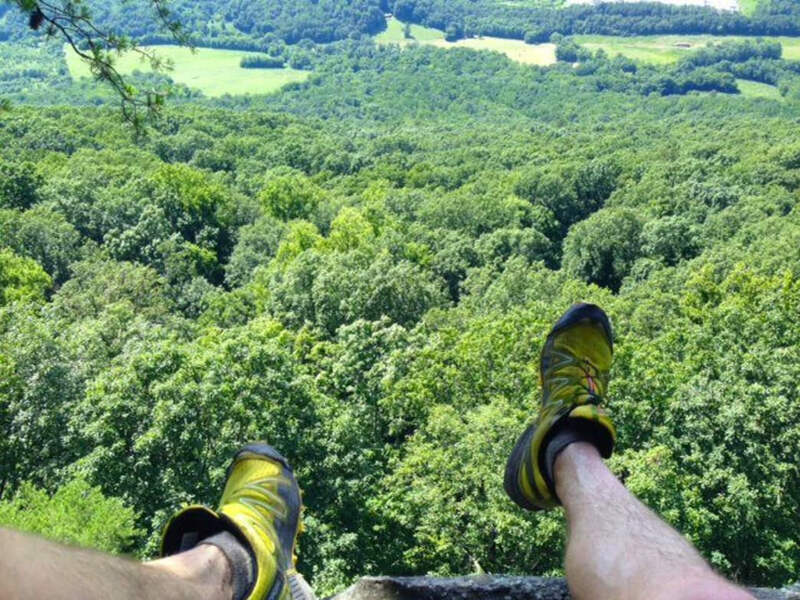 Depending on your desire and fitness level, these routes will certainly please you. They’ll probably challenge you as well, and the views from the top of Lookout are definitely worth the trip.